These yummy peanut butter and oreo brownies are not only extremly yummy, terrible if you are on a diet but they also look really really good and are completely irresistible. I don’t know how many calories, grams of fat or anything like that these little babies have I just know they are the finest looking brownies I have ever produced. 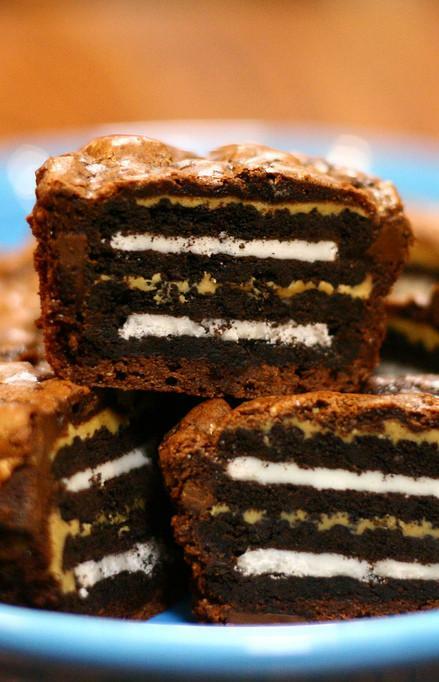 All you have to do is prepare your brownie mix, spread over the oreos and bake. Preheat your oven to 350°F (180°C). Line the muffin cup baking pans with 16 paper liners. Stir in the sugar, eggs and vanilla with a large wooden spoon. Add the cocoa, flour, salt and baking powder, beating well after each addition. Assemble the Oreo cakes and bake. Spread 1 teaspoon of peanut butter on one Oreo cookie. Place another Oreo cookie on top of the peanut butter. Put the double-stacked cookie into a muffin cup. Prepare the other cookies in the same way. Spoon about 2 tablespoons of the brownie batter over each stacked Oreo. Allow the batter to run down the sides of the stacked cookies. Bake the cakes for 18 to 20 minutes until the brownie mix is cooked through. My niece made this recipe today, doesn’t it look so yummy? Me going to try this soon!